1) Lot 10 of the sale, catalogued as Ramsay though of the Shackleton type, face mask, reversed; very close to NPG 670 by Hudson (see George II). 2) Some Materials Towards Memoirs of the Reign of King George II by John, Lord Hervey, ed. R. Sedgwick, 1931, I, p 66. 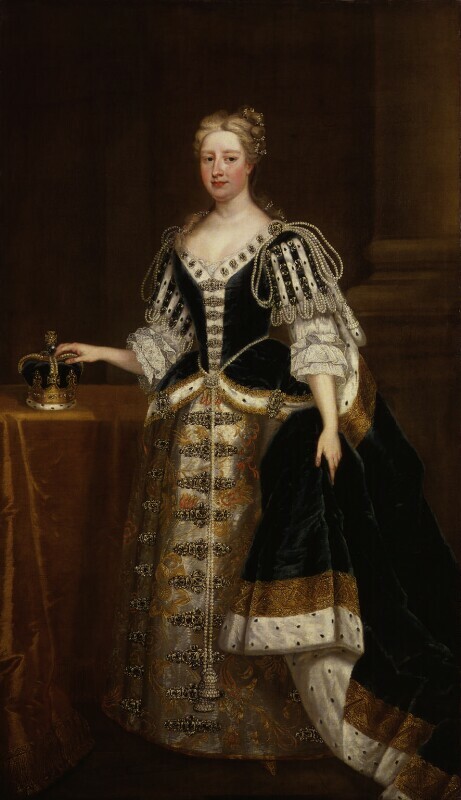 Fair hair dressed with diamonds, blue eyes, pale grey eyebrows, fresh complexion; grey half-sleeved dress with gold and red flower pattern, dark blue robe of state with pearls looped at shoulders, black diamond motif down front of bodice and skirt, long corded girdle loosely knotted at waist; behind her a pillar, right, and, left, a table with crown on which she rests her right hand; yellow stone floor. The chest over-cleaned in the past; an old horizontal damage in the floor, bottom left, about 4 ½ in. above the stretcher bar; cleaned and re-varnished, 1957. See George II, NPG 368, Provenance. This extended catalogue entry is from the out-of-print National Portrait Gallery collection catalogue: John Kerslake, Early Georgian Portraits, Her Majesty's Stationery Office, 1977, and is as published then. For the most up-to-date details on individual Collection works, we recommend reading the information provided in the Search the Collection results on this website in parallel with this text.